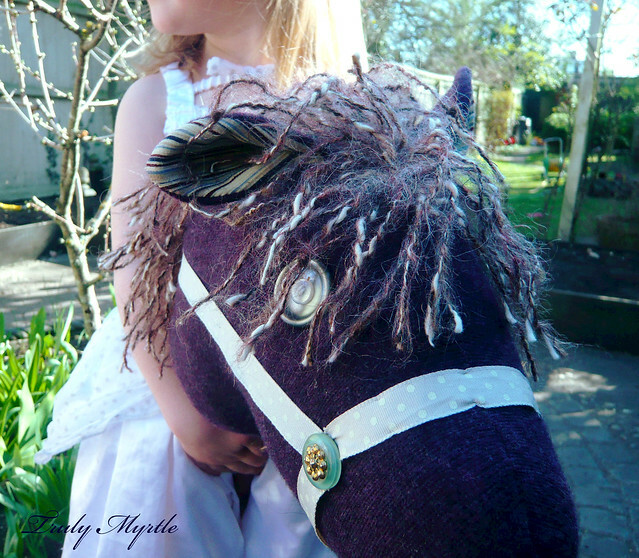 Violet, the woolly hobby horse is one of the projects here at the Myrtle home that has been waiting to be finished for AGES. It was started in late 2011, with good intentions of giving it to the baby for Christmas. And, I started off pretty well. I had the perfect purple sweater hoarded away, stripy needlecord for the ears in my stash, and a wooden broom-handle in the garage. It sewed up quickly and was a great shape. I loved the ears and the crazy multi-coloured mane, but quickly realised that I'd made the head WAY too big. 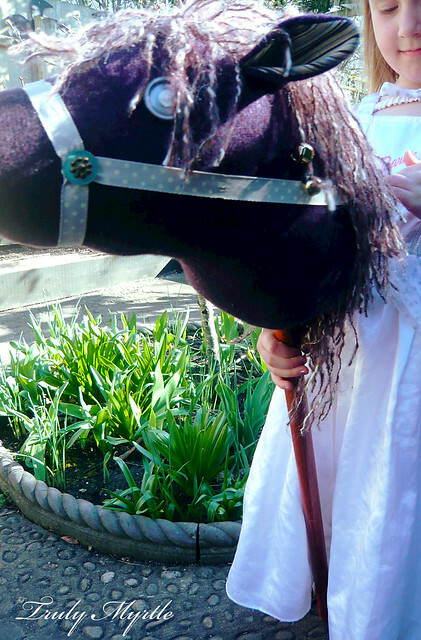 At that size, it was destined to be a hobby horse for Mr Myrtle, not a tiny toddler. So the head sat around for a few months. Limp, unstuffed and unadorned, it waited to be shrunk to size. 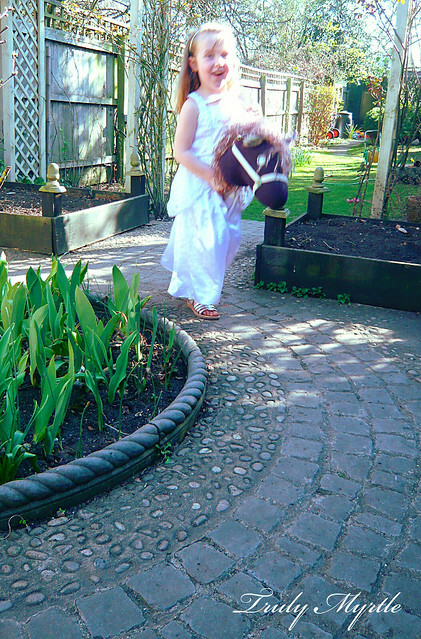 I had another burst of energy as the baby's birthday approached. I turned the head inside out and carefully made it smaller, trying to save the super mane and keep the great horse shape. I sewed, cut and tentatively turned it right side out. Success!!! But, there it sat for a few more weeks, while other more appealing projects were started and finished. 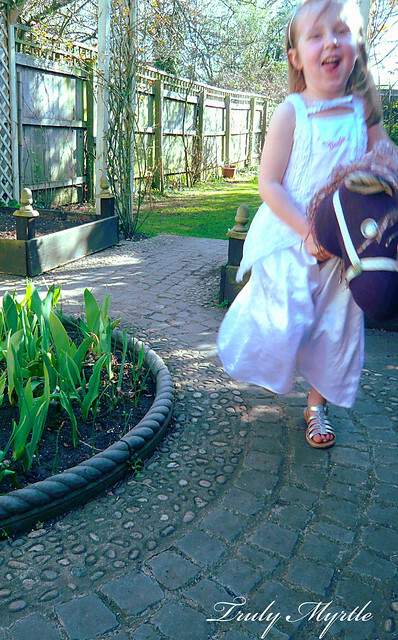 Somewhere along the line the kids realised what was happening and took a fancy to the horse head on the long broom-handle. I think it was them, dangerously waving the long stick about, that prompted me to get the jolly thing finished! So I tackled the rest a bit at a time. First, I cut the broom-handle shorter. It suddenly seemed less of a weapon and that was something of a relief. To think, it only took a few minutes! Procrastination eh? 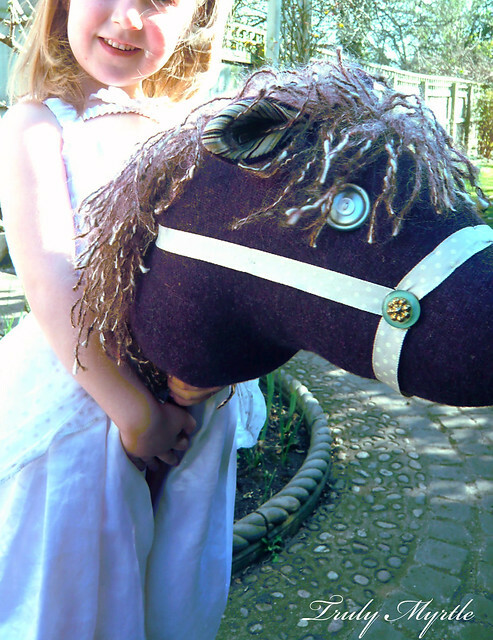 Next, I found some spotty ribbon for the reins and some fabulous buttons. I love these old green and gold buttons. They were a fantastic, random discovery in a HUGE jar of old buttons at a new little shop Rejuvinate that I literally stumbled upon on my walk to town one day. An absolute treasure trove! (You'd fall over if you saw how many buttons I bought that day...don't tell Mr Myrtle for goodness sake, he doesn't understand the lure of a good button). 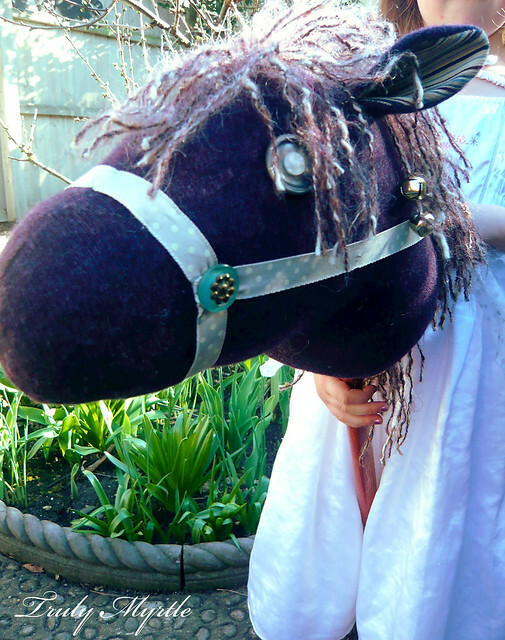 Days later, with a couple of bells attached to the mane (not too many to protect my sanity...) and buttons for eyes, Violet (the girls insist she is a she) was finished! I'm rather fond of her. Look, she's not perfect, but she's adorable and, do you know? A very fast runner! If you'd like to make a Violet too - I found the fab tutorial here! So, tell me I'm not the only one! Do you procrastinate too?